Built in 1905, the Abbey House Inn is a charming, restful stay in Winters, in northern California. 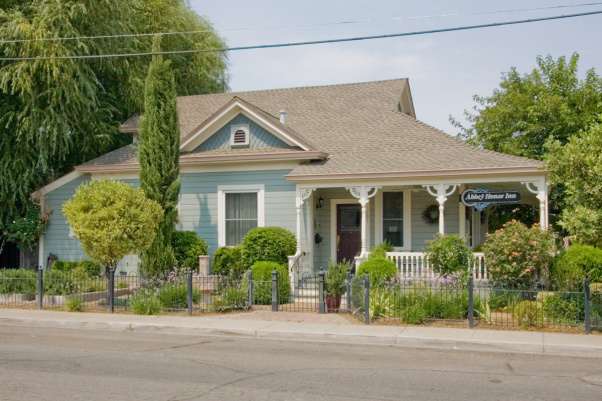 A long-held secret of Yolo County, this quaint, old-fashioned country town is nestled in the “Blue Hills” and features a two-block historic downtown just a short stroll away. This setting is the perfect retreat for the vacation or business traveler. The Abbey House Inn, a historic turn-of-the-century cottage has been lovingly restored and updated offering guests a spacious dining area and parlor with an old-fashioned wrap-around porch for relaxing. Each well-appointed bedroom includes a private bath and some have a whirlpool tub and cozy fireplace. Guests who venture on foot into town (just one block away) will be rewarded with the “best breakfast in Yolo County” at the Putah Creek Cafe, where seasonal dishes and fresh baked goods await in a friendly, hometown atmosphere. Handicapped access and accommodations are also available.